When your wife, having recently lost her position at an attorney’s office, asks how you feel about her signing up with a direct sales business, there’s really only one safe answer – “Yes dear, I completely trust your judgment.” Even when you measure in the fact that we had both just started our master’s degrees, a smart husband knows there’s still only the one answer. Of course I had my reservations, but I decided to keep them to myself. Not because of an unwavering faith in my wife’s business prowess, but rather because our couch was terribly uncomfortable and I didn’t fancy spending the next few weeks sleeping on it. OK, so maybe I’m being a bit overdramatic – I gave the usual amount of support and encouragement, and she really did work hard at developing her Premier Designs business, but I definitely kept a great big “I told you so” at the ready. One evening, my wife came home from a show told me how much she had earned that night. Being in a particularly sarcastic mood, I had said something to the effect of, “Yeah, but did you really earn that, or are you still working to pay off your investment?” Boy did I feel like a jerk when she told me that she had earned back her investment long before. In fact, she had done so in just 45 days! Ok, so I never got to use that “I told you so” I had been hanging on to. In fact, I was quickly beginning to see that Jessica’s endeavor into Premier would be unlike anything she had ever done before. She was having a great time, meeting some wonderful people, and receiving plenty of recognition. Unfortunately, as a guy, I wasn’t all that motivated by ribbons, hugs, and shiny things. 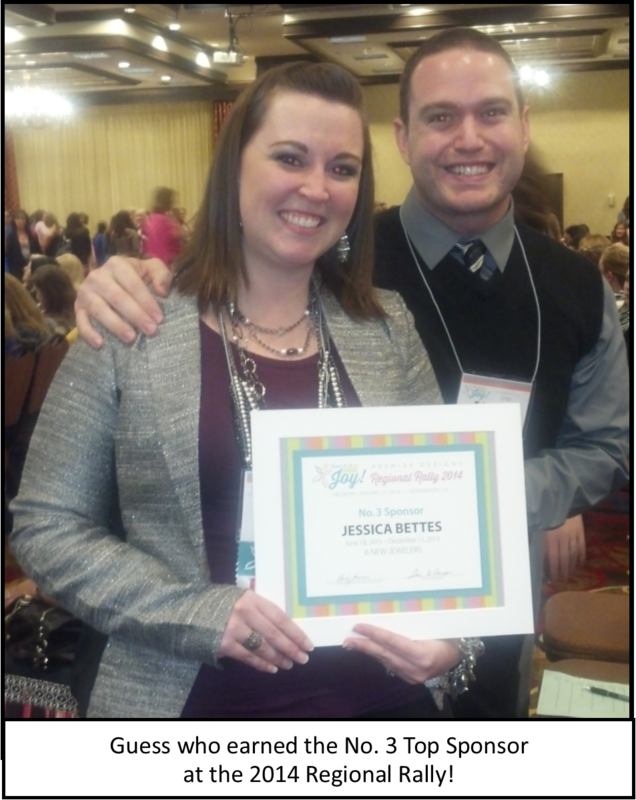 What did motivate me was income, which, through hard work and consistency, Jessica was bringing that in as well. In fact, her whole personality had become more optimistic and self-confident. However, I continued to think Premier as “Jessie’s little jewelry business”. 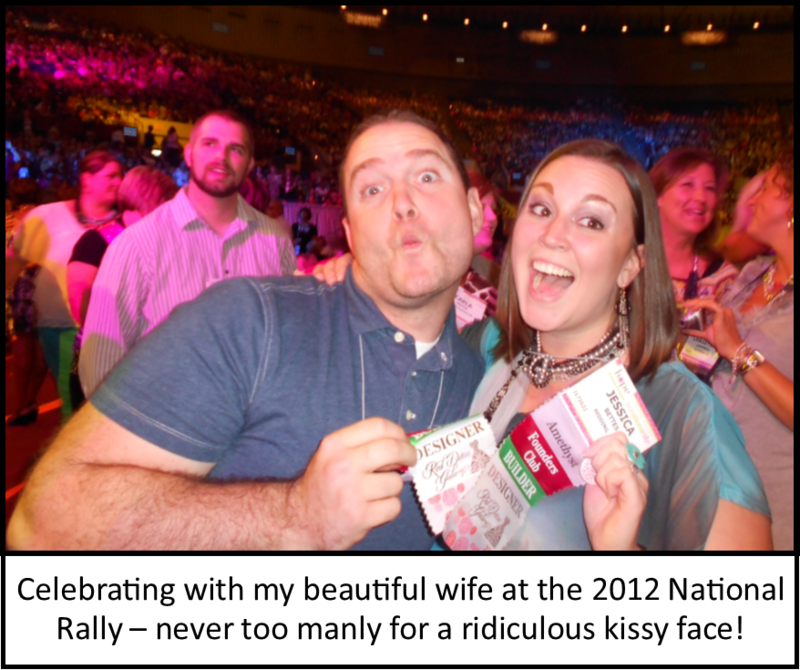 That all changed when I attended the 2012 National Rally. I was absolutely blown away. I realized that we were a part of something bigger than jewelry and purse games, and far bigger than commission checks and total retail numbers. Over the next year or so, Jessica and I found a number of small things that I could do to help out with our Premier business. I labeled catalogs, filed paperwork, and stamped more receipts than I could possibly count. I had even helped to sign a couple of the girls in our downline. At the 2014 Regional Rally, we had challenged the girls in our downline to complete a scavenger hunt in which they would be seeking advice and sharing business ideas with other Jewelers. I decided to join in the fun, but I couldn’t shake the nagging thought that I didn’t have any business sharing ideas since I had never actually run my own shows. Later that day, as we were discussing the Regional Rally Quick Start opportunity with the girls in our downline, I made some joke that I’d do my own Quick Start if they’d work to do theirs as well. So much for it being a joke; with half a dozen women eagerly taking me up on that challenge, I was pretty much committed. I knew our girls well enough to be sure they’d never let me back down quietly. Resigned to my fate, I decided to launch the Man vs. Quick Start page as a way to keep myself accountable to our downline and to be a “running buddy” to them as they worked on their own Quick Starts. Before launching the page, I sat with my finger over the “post” button, going through all of the same fears that any new Jeweler has: Will I be any good at this? How will I get bookings? Is this really a good idea? Do I even know the first thing about jewelry? I had no bookings, no potential Hostesses, and no idea what I was doing – and I was about make this whole fiasco very public. By this point, we had been with Premier for about three years, and Jessica had already done shows with everyone I might’ve gone to for my Quick Start – parents, coworkers, close friends, neighbors, etc. In fact, many of them were now Jewelers themselves. After texting about ten people, I was about to throw in the towel – after all, I had clearly asked everyone I knew. However, I had been more than a little public with this challenge, and failure was not an option. I went through my contacts and, with pen and paper, wrote down the names of anyone who might possibly, maybe, ever, even on the most remote chance hold or even attend a Premier show. I sent a personal message or made a phone call to each and every one on that list. I managed to book exactly zero shows. Before long, my wife lovingly cut short my pity party and told me to hold my own Mystery Hostess Party – when all else fails, be your own yes. However, my calendar was still looking pretty barren – I realized that I clearly wasn’t going to be able to pull this off on my own, and I decided to turn my business over to God – if anyone could make it happen, He could! I started to receive belated responses to my original messages and, before I even had time to hold my Mystery Hostess Party, I had a handful of shows on my calendar. Thank God! Of course I still kept making phone calls – after all, I had twelve shows to book. Now I just had to figure out how on Earth to “do” a jewelry show. Until then, I hadn’t realized just how much of our verbiage included the words “Jewelry Lady”. In fact, there were quite a few things that would need to be tailored to fit the role of a male Jeweler. Purse games gave way to scavenger hunts, words like “fabulous” and “super cute” were replaced with “beautiful” and “detailed,” and hot pink Diva Dollars became light red Bro Bucks. I was happy to find that most people were very receptive to the idea of a male Jeweler, and I only received a few questionable remarks. While doing a show with some of our friends, a good buddy jokingly made the parting comment, “Have fun, we’re going to go play video games,” to which I couldn’t help but respond, “Have fun playing video games, I’m going to get paid to hang out with your wives.” Hey – I never claimed to be the most mature businessman. The following weeks were a rollercoaster of excitement, frustration, growth, and celebration. With just two days to spare, I made my Quick Start Six! Cutting it close, I then finished my Quick Start Nine with only one day left. Then, apparently to stick with the trend, I completed my Quick Start Twelve on the very last day of the challenge! Never, ever give up on your goals. I am certainly not the first man to be active in Premier. There are many other hardworking and dedicated men in this business who spend hours supporting their wives, their families, and so many other Jewelers in Premier. Men like Andy Horner, Randy Draper, Keith “Honey” Ungerer, and my Premier Grandpa Ryan Greenwood have set examples of love, honesty, and a genuine care for others. I am truly blessed to have so many amazing men to look up to. Doing jewelry shows isn’t for everyone, but that doesn’t mean that husbands and men can’t play profound roles in Premier. During the Man vs. Quick Start challenge, I had a number of people ask for ideas about getting their husbands involved in Premier. At the 2012 National Rally, a leader in Premier pointed out that there is more to a successful business than just the salesperson – office management, billing, correspondence, even facility maintenance. We, as men, can learn to play these roles, but we may need some guidance. Guys, the first steps are to carry your wife’s jewelry to her car, tell her that you love her, and remind her that you’re proud of all her hard work. Completing my Man vs. Quick Start Challenge was one of the most exciting and rewarding experiences I have ever had, and I definitely couldn’t have done it on my own. With more than 75 running buddies on the Man vs. Quick Start page, I received more encouragement, accountability, and advice than I could have imagined. I’d like to very publicly thank all of you for friendship and support. I wish you all the absolute best in your lives and in your businesses, and I hope to see you at this year’s National Rally. I’d love to see your “Man vs. Quick Start” page!! Did I miss the link? LOVE your attitude and hard work – I am sure your wife is so proud! Such a great article! You truly are an inspiration that we can get there from stage 1 and 0 bookings even with all the fears of not succeeding. Thanks! Thank you, Amanda! It was an awesome experience for both me and my wife. Ha – it also gave me a very healthy appreciation for all that she does. I can’t wait to see what’s next in our Premier Designs journey! This dude is, dare I say, “FABULOUS!” And he’s spot on too. The vast majority of guys reading this will never actually do a jewelry show, but that’s perfectly fine. The best thing you can do to support your wife and Premier business is as Mike said, “to carry your wife’s jewelry to her car, tell her that you love her, and remind her that you’re proud of all her hard work.” Just doing that will bless her business and bless your marriage. It’s a Win – Win! We are proud of both you and Jessica! Thanks for sharing your story, it was amazing. I know your wife is so proud of you! Awesome! A supportive husband is the most wonderful thing for a Jewelry Lady! You guys just don’t even know how amazing it is when you are fully on board! What a blessing! My wife and I have been in Premier for almost two years and I am starting Seminary in August. I would really like to start doing my own shows to help pay for it an was wondering if I could get your verbiage? I’ve done a show before for my wife but want to make it more male friendly with some of the terms and am a firm believer, as a teacher, that you shouldn’t try to reinvent the wheel. Thanks for any help. This is AWESOME!! Such a great example of a loving supportive husband. This is truly the Premier spirit! Thank you all SO much for your kind words and support. Premier has been a huge blessing for our family, and the Man vs. Quick Start challenge was such an awesome experience for us both. Curtis, I am definitely still learning as I go, but I’ll gladly share anything I have learned with you. If you look for “Man vs. Quick Start” on Facebook, you can find me through that page. You are also welcome to contact me via email at MJBettes@gmail.com. Wow, Mike- my husband of nearly 45 years carries my jewelry to the car and is my best supporter, but I have to say, I’m so impressed by your commitment to your wife and doing the business together! I have a new jeweler (my first) and I’m inspired to encourage her by doing what you courageously did. Thanks for sharing this!